I love cyclists who use their bell properly – we’ve actually been teaching C to use his on his balance bike 🙂 When we were on the Gold Coast the only cyclists who used their bells were teenagers and children, and it made such a difference when I had time to make sure C was safely out of their way. BOO at that cyclist! Yay at everything else (especially proper use of bells). 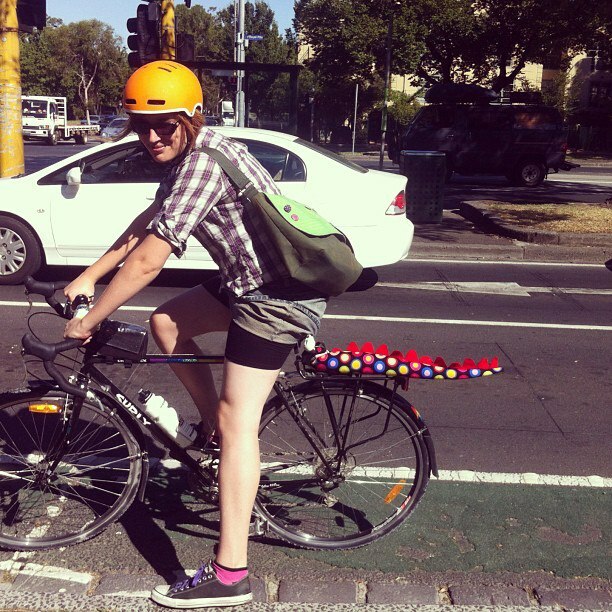 Two pedestrians have been killed by cyclists in Vic, sadly. I hope some decisions are made about improving Sydney Rd sometime this year. Just on “consider riding a bike” – we are all car users at one point or another. For some cycling will never be an option, eg age, disability. The issue is the unwillingness to share the road, as nice as it is to imagine that carfree utopia! 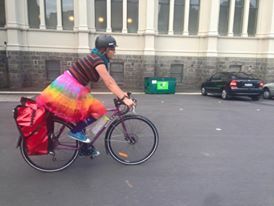 With respect pfctdayelise, I’m not sure you have given much thought to the relationship between cycling, cycling infrastructure and those with disabilities. The major barrier to people with disabilities to riding is the lack of safe infrastructure. I say this as someone with a disability who does not have the ability to ride a normal bike, but rides a throttle driven ebike instead. There are many types of bikes out there, suitable for people with many different kinds of disabilities. Sadly the infrastructure is not. Those gaps in the infrastructure, “cyclists dismount signs” might be minor barriers for able bodied cyclists, but are major barriers for the non able bodied. “Sharing” the road creates conflict and will lead to injury and death even when all road users are on their best behaviour. The solution is infrastructure that is designed with cyclists as a primary thought, not as an after thought. When cycling is considered safe by most, most people will choose to cycle, (at least occasionally) and we would no longer see the misplaced anger against cyclists. International best-practice is low speed suburban roads (lower speed limits to 30 kph), and an interconnected network of separated cycle tracks along major travel routes. Separated means being separated in either physically separated space or time eg. including dedicated signalling intervals for cyclists at major intersections.